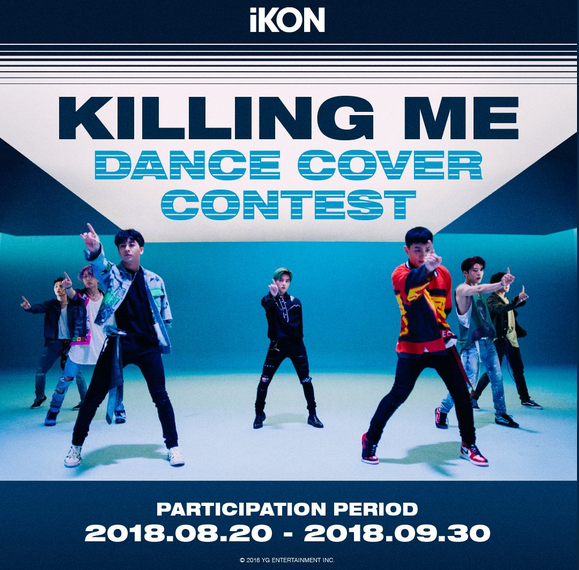 To celebrate the release of iKON’s title song ‘KILLING ME’ from the new mini album <NEW KIDS:CONTINUE>, we are holding a ‘iKON KILLING ME DANCE COVER CONTEST’. 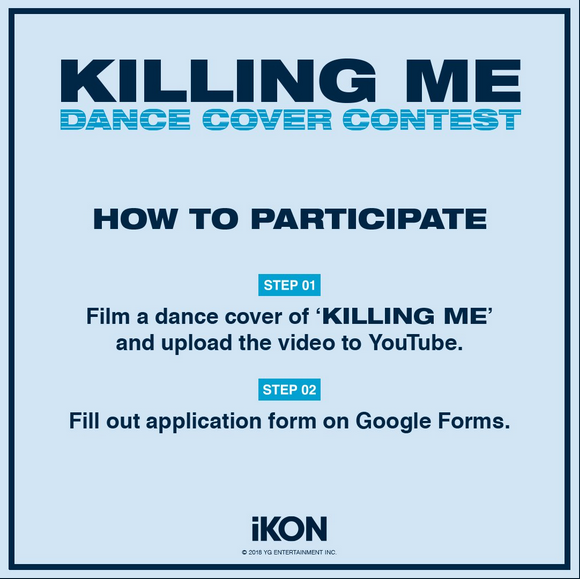 Cover iKON’s powerful ‘Killing Me’ choreography and complete the following two participation method steps below! Winner Announcement : 2018.10.04(Thu) : Scheduled to be announced on YG LIFE and on official iKON social media accounts. Film a full length dance cover of ‘Killing Me’. Upload video to YouTube. Commenting either your video link or an explanation of 'why your video should win’ under iKON's official SNS (Facebook or Instagram) will increase your chances of winning. ‘iKON 죽겠다 DANCE COVER CONTEST’를 진행합니다. 아이콘의 파워풀한 ‘죽겠다’ 안무를 커버하고 아래 2단계 응모방법을 모두 완수해주세요! 총 3팀을 선정해, 총 상금액 1천 5백만 원을 증정합니다. 1) ‘죽겠다’ 완곡의 댄스커버영상을 촬영해 YouTube에 업로드한다. ** iKON의 공식 SNS(페이스북 혹은 인스타그램)에 본인의 참여 영상 링크 혹은 우승기원 댓글을 남겨주시면 우승 확률이 더욱 높아집니다!